Eli Monpress has a bounty on his head, and it's not big enough to suit him. He needs to steal something really big to increase it, but he'll start small and steal something no one will miss. Like a king. With the help of his partners--a swordsman with a magical sword and a demonseed who can punch through walls--the initial theft goes off without a hitch. But Eli's well-laid plans soon go awry, thanks in part to the straight-laced wizard Miranda, who's out to capture him, as well as to the plots of a villain with a more sinister nature than the charming thief. The Legend of Eli Monpress by Rachel Aaron is a collection of the first three novels in the series and includes The Spirit Thief, The Spirit Rebellion, and The Spirit Eater. 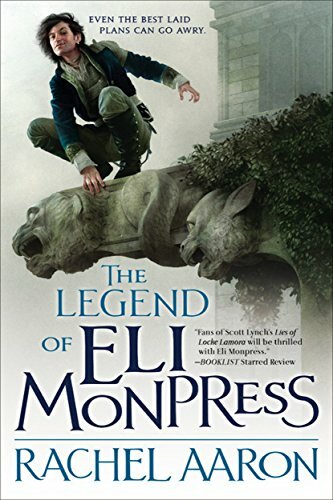 The Legend of Eli Monpress benefits from amazing world building, engaging characters, an engaging writing style, and a good dose of action. The magic system is different than the Harry Potter-like systems I'm used to. Wizards talk to the spirits of objects and make agreements with them, offering protection in return for the object's help. Except for Eli. He just charms them into doing whatever he wants, like charming a door to come off its hinges so he can escape a prison cell. It also includes Storm Lords, a powerful demon entrapped in a mountain trying to get out by seeding children with splinters of himself, and gods, to further complicate matters. In some ways, this magic system and world is refreshingly different from what I'm used to; however, it can also be a bit uncomfortable, a reminder that what I view as pure imagination and fantasy, can have elements of belief systems some people actually follow. But whether or not you should only read things that clearly agree with your worldview is not the subject of this post. While entertaining, the collection lacked two essential things in my opinion: novelty in the over-arching plots and character growth. In each book, I found the same struggles in the subplots of Eli's partners--the swordsman and the demonseed. Someone wants to steal the swordsman's magic sword and very nearly kills him for it, and the demonseed (a child who was implanted with a splinter of the demon in an attempt for the demon to grow and then escape) struggles with using the powers the demon gives her without letting it take control of her and escape. It's an interesting struggle, and I want the girl to be free, but by the end of the third book, I'm a bit tired of the repetition and lack of resolution for both her and the swordsman. As for the charming thief Eli, at the end of the collection, he, in many ways, is still the same selfish, childish thief out to spite his disciplinarian father (by becoming the world's greatest thief with the highest bounty) as at the beginning. He does the occasional noble deed but never exhibits any compunction for his crimes or a desire to change. The wizard Miranda, who's out to capture Eli, is honorable and a rule-follower, and is a good balance to Eli, but if you're hoping for a romance between them, you'll be disappointed. I love a good redemption story, but this isn't it. It is, however, an entertaining read. Thanks for this review, Lizzie, this series sounds interesting! I'm intrigued by the magic system you described, my favorite was being able to charm a door off its hinges :) But I'm guessing I'd have the same frustration with lack of character growth - it feels like a character's journey has no point if they haven't learned anything by the end of it. Yes, I guess it depends on what you're looking for--a character type, like charming thief, an assassin, or a super spy, and some action--or a growing character. The author, Rachel Aaron, by the way, wrote the popular post on writing 12,000 words a day. I don't think I'll ever accomplish that!